Check out what’s happening around Pennsylvania this month as you travel the state in your RV. From festivals to events, there’s something you’re bound to enjoy. Head to Fort Ligonier in the town of Ligonier from October 12-14 to commemorate the battle that took place there in 1758 in the French and Indian War. This is the event’s 59th year, which features a living history encampment that showcase frontier life, military tactics, drills, cannon firing, music and more from the time period. Admission is free, though there are paid attractions and activities inside. In Bethlehem from October 12-14, you can experience German culture, including the German immigrant subculture of Pennsylvania. 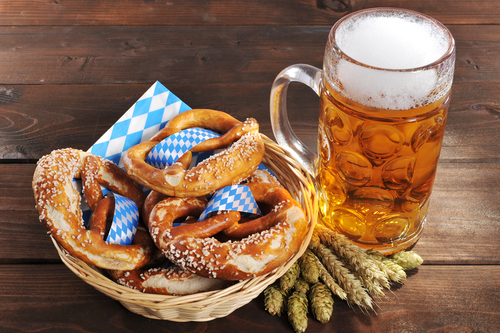 There will be German brews in the biergartens, live polka music, authentic German cuisine and more. There’s no cost to attend. Experience German culture done Pennsylvania-style at Oktoberfest in Bethlehem. Sample brews from large Yuengling Biergartens, listen to live polka, get your fill of authentic German food, and watch axe-wielding lumberjacks of the Great Lakes Timber Show. Don’t miss the Hasselhoff-Off or Yuengling Oktoberfest 5k. Happening from October 20-21 in East Stroudsburg, the Pocono Food Truck & Art Festival features a lineup of more than 25 vendors, including some of the best food trucks in Pennsylvania. You’ll be able to vote for your favorite truck during a contest. There will also be artwork on display available to purchase from painters, photographers, sculptors and more. It costs just $12.50 for adults, $8.50 for kids 5-12, and is free for those younger than 5.